BP has been through a lot lately. Filling the Gulf of Mexico with millions of barrels of oil for one. Then CEO Tony Hayward resigned over pressure from the way he handled (or didn’t handle) the oil spill. Finally, BP just announced that so far, the company has lost $17 billion dollars because of the oil disaster in the gulf. BP names Robert Dudley the new CEO of BP. Dudley is an American. The first non-British CEO in BP’s history. Dudley will take his new post at BP at the beginning of October. However, in the pre market, BP is up +0.25 (0.65%). 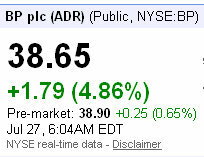 BP shares (NYSE:BP) closed yesterday at +1.79 (4.86%) at 38.65.